Place whole potatoes into a pot of water and salt generously. Bring to the boil and simmer for 10 minutes until a skewer enters the potato easily. Drain and rest potatoes until cool enough to handle. 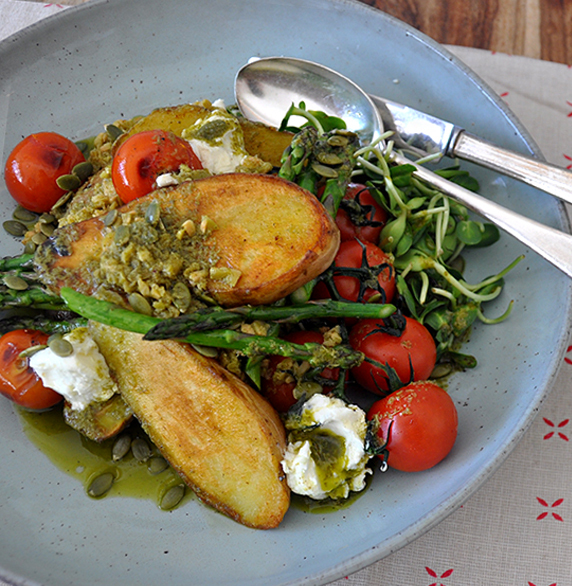 Slice the potatoes into 3 lengthwise and oil generously along with the asparagus and cherry tomatoes. Pre-heat BBQ grill to medium high. Start by grilling the potatoes on each side until charred. Add asparagus and tomatoes to BBQ and cook for 2 minutes, turning a couple of times. Remove all vegetables to a tray. Mix the lemon juice and olive tapenade and season to taste with salt and pepper. Create a stack of vegetables on a serving platter and drizzle liberally with your tapenade. Dot with goats cheese and finish with sprouts and pepita seeds. Serve in a generous wide bowl.